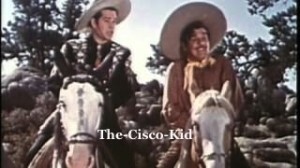 Cisco Kid The Old Bum Duncan Renaldo, Leo Carrillo, Tanis Chandler and Hank Patterson. Los caballos–muy lindo! Cisco’s horse remains the prettiest pinto I’ve ever seen–black and white is rare–and Pancho’s “Loco” is so striking w/ those blue eyes. Thanks for the info about their ages; that explains something about Cisco’s make-up that’s puzzled me for some time. He is much lighter than Pancho, but it’s not completely natural-looking, and glows a little in the camera lights. Good episode–“les’ WENT” to the next one! I was quite dissapointed when I found out that the movie I wanted to see, (“Rachel And The Stranger”) wasn’t there to be seen.